Some professions just aren't for everybody. Like, if you're afraid of ghosts, then you probably shouldn't be a paranormal investigator. But if you ain't afraid of no ghosts, then by all means... get out there and bust 'em! If that's her career choice, then she's going to have to work on a lot of things. It's not all proton packs, blastin' and bustin'. No, she's got to be an engineer, a scientist, a philosopher, even. All of those come in handy when you're facing the supernatural world. But she's smart, works hard, loves to learn about new things... as well as trap specters and spirits in her hi-tech trap gadgets. When there are ghosts flying around Grandma's house, scaring her at all hours of the day, who are you gonna call? The Ghostbusters, of course! These trained professionals are always there armed with their proton packs ready to rid any home of unwanted spirits. Sounds like she is ready to join the team already! Okay, but she's got to get the standard gear first. 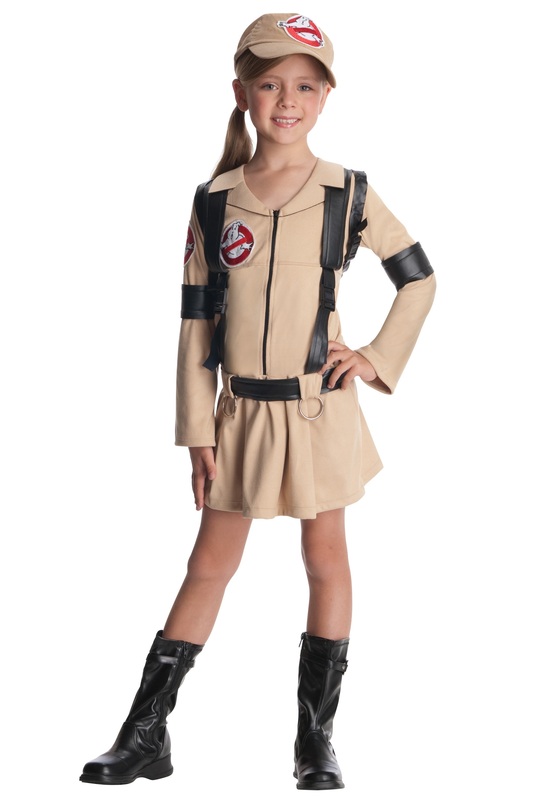 This classic Ghosbusters costume for girls is inspired by the ones worn in the iconic film, with a skirt and jumpsuit top. Don't worry, she can keep her trusty proton pack with her comfortably because of the faux leather straps. The proton pack is inflatable, but that's a good thing, because we're not sure if she's ready for a nuclear powered device quite yet (someday!). All that's left is to wear the cap with embroidered patches on top and she'll be all set to join the ranks of the famous Ghostbusters and do what she does best: bust some ghosts! I recommend not using the measuring chart & go with the size your child wears in clothes. Perfect fit & fantastic service. Delivery was quicker than delivery date provided.